Beyond Popcorn: Theaters Try Seat-Side Food Service Movie theaters have long thrived on refreshment revenues, but a sizable percentage of patrons don't visit the concessions stand. AMC Entertainment is trying to boost business with a new dining option — restaurant-quality food, served by waiters as you enjoy your movie. Movie theater companies have figured out that many of us don't buy any snacks when we go to the movies — and that they're losing a huge amount of money as a result. So, theaters from Florida to California are starting to offer options — more healthful, hotter and more substantial options — for dinner. "I recently had someone tell me whatever you do, never change the popcorn," says George Patterson, the vice president for food and beverage at Kansas City, Mo.-based AMC Entertainment. "She said, 'I grew up as a kid going to movies with my dad and it was always about, don't change the popcorn.' "
So Patterson is keeping what works. But he knows concessions are the company's bread and butter, and that a third of his moviegoers don't buy anything to eat at all. 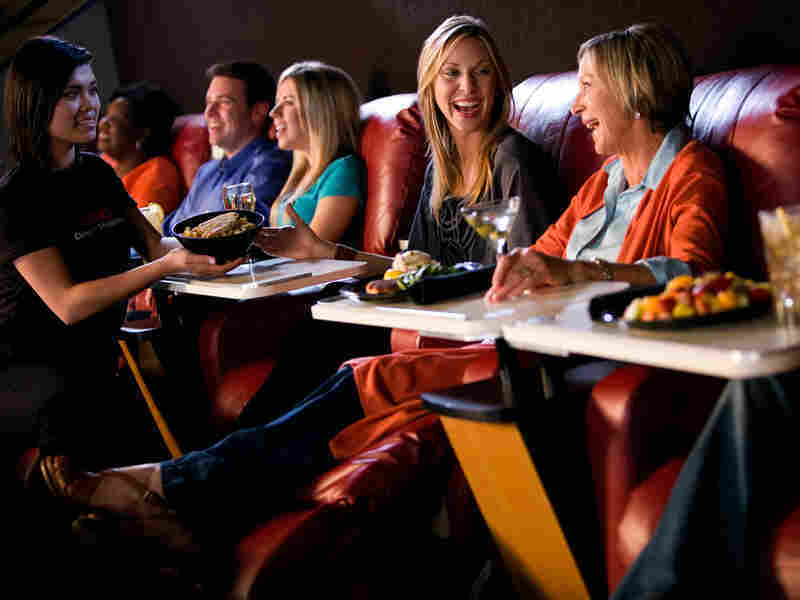 To entice that group, Patterson has brought premium restaurant dining to the movies: reserved seats, luxury recliners, even seat-side service that includes cocktails. AMC Mainstreet in Kansas City is one of the premier locations for this new service. The first thing you notice when coming in is that most of the regular movie seats have been replaced with soft leather recliners. In between the luxury chairs are tables with low light, salt, pepper, ketchup — and TV trays. I asked local food critic Charles Ferruzza to come to AMC Mainstreet to see Madea's Big Happy Family. "It's sort of a like an Applebee's menu," he says of the movie theater's dinner options. "Very accessible food, nothing too exotic." The new addition to the AMC Mainstreet movie theater in Kansas City, Mo. — dinner-ready recliners, complete with tray table and condiments. No accident here. An Applebee's corporate chef was hired to help with the food service. We press the little red button, as if we were calling the flight attendant on an airplane, and a young waiter glides over to take our order. "I'll have the Classic Italiano Flatbread pizza," Ferruzza says, adding a side salad to the order. A side salad? Who wants to sit next to someone in a movie crunching a salad? Turns out, most people here don't mind it. "Everyone else is eating," says our waiter, Shawn Edmunds. He says he gets few complaints, though occasionally, someone gets annoyed when he crouches over in the dark to take the order. "Some people ... when you try to go to talk to them they try to shoo you away a little bit," he says. "But usually I try to walk pretty fast, so it's not that bad." AMC's Patterson is aware of certain problems and says the company is working on them. It's figuring out how to ensure that food comes out hot, in a timely manner, and which items are best suited to eating in the dark. It's all about becoming what he calls more "guest-centric" — giving people choices, like baseball did when it expanded from beer and brats to barbecue and sushi. 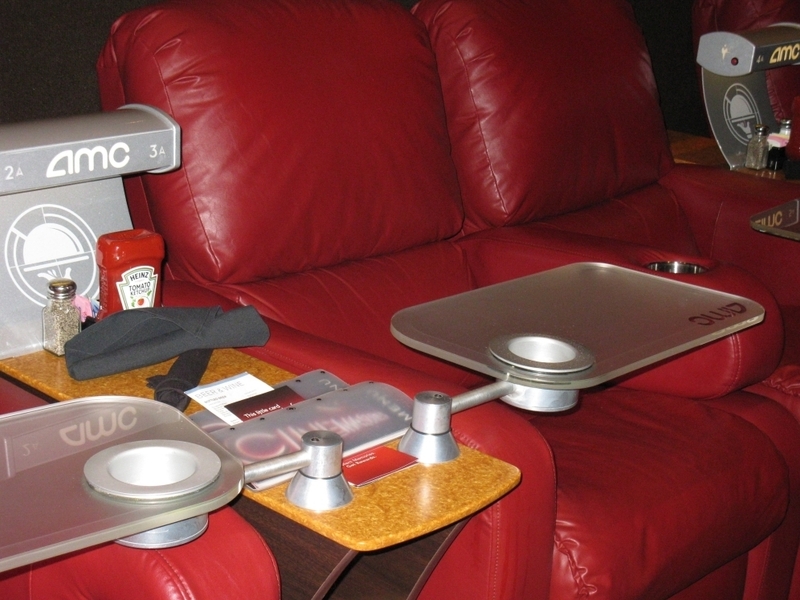 Meanwhile, AMC is continuing to develop the dine-in theater concept. It has just opened one in Orlando, Fla., and another will open in Phoenix by year's end. With movies now in high definition, 3-D and surround sound, Patterson says people are looking for an upgrade in their eating experience as well. "Just soft drinks and popcorn ... although those elements have paid the bills for the last 90 years for AMC, we have to look beyond that," he says. "What does the guest expect? And then what do we have to do to exceed that expectation?" Patterson says the company is testing the dine-in concept as one of a dozen new initiatives aimed at boosting revenues. While the numbers have been good so far, he says it's too soon to know whether customers will take to the idea of having more ambitious meals with their movies.